Tired of measuring and spilling your laundry detergent then give Purex's Power Shot Detergent a try. This is a new concentrated detergent that does the measuring for you. This is the only bottle that automatically dispenses the right amount of detergent for you so you do not waste detergent. All you have to do is open the cap, flip the bottle to deliver the detergent, flip the bottle back over and you are ready to pour the next dose. Now that is easy!! It also comes in 2 fragrances that you will love: Mountain Breeze, and Natural Elements Linens & Lilies. This was very easy to use. Just follow the directions and you will not be over measuring and wasting detergent.It was a little weird at first because I did not know if if got the right amount of the detergent out of the bottle but I figured it out quickly. I was provided with the detergent in Mountain Breeze my favorite scent. I have always been a fan of Purex Detergent and this product has not let me down. All of my clothes were clean and fresh. Still confused Check out the video below. Purex is hosting a fantastic sweepstakes and you could win a Washer and Dryer. We’ll also email you a $1.00 off coupon when Purex® PowerShot™ Detergent is available at your favorite retailer. Enter here to win a coupon to try the product for yourself. Open to USA only. Contest ends 2/7/15 @11:59 PM EST. Good Luck. 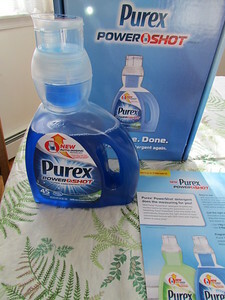 Disclaimer: I was provided a free bottle of the Power Shot Detergent by Purex for my honest review. All of my opinions are my own.